VANCOUVER , Oct. 10, 2018 /CNW/ - IsoEnergy Ltd. ("IsoEnergy" or the "Company") (TSXV: ISO; OTCQX: ISENF) is pleased to provide an update on exploration targeting results for extensions of uranium mineralization intersected in previously reported drill hole LE18-01A – the Hurricane zone. Drill hole LE18-01A was completed on the 100% owned Larocque East property (the "Property") in the Eastern Athabasca Basin, Saskatchewan in July. A broad, 8.5-metre-long interval of elevated radioactivity (see news release dated July 25, 2018 ) averages 1.26% U3O8 (above a cutoff of 0.1% U3O8) and includes a zone of off-scale radioactivity (>15,000 cps on an SRAT SPP2 scintillometer (the "SPP2")) that averages 6.45% U3O8 over 1.0 metre. Steve Blower , Vice President, Exploration commented: "The drilling targets generated by the integration of trace element geochemistry, clay mineralogy and structural geology are encouraging and suggest that there is a high probability of expanding the Hurricane zone in several directions. The follow-up drill campaign scheduled for the winter drilling season beginning in January, 2019 will be exciting." Mineralization at the Hurricane Zone (see the location map in Figure 1) lies beneath 40 metres of overburden and 285 metres of Athabasca sandstone. Basement rocks are dominated by pelitic gneisses that are commonly highly graphitic. 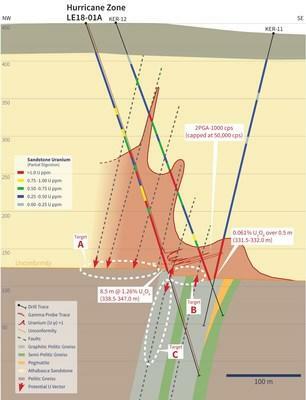 Drill hole LE18-01A intersected an 8.5-metre-long interval of uranium mineralization that straddles the sub- Athabasca unconformity and consists of fracture controlled and disseminated pitchblende with hematite and clay from 338.5-347.0 metres (down-hole length). On the LE18-01A cross-section (Figure 2) there are several features that indicate the unconformity hosted mineralization may extend both to the northwest and to the southeast. Additionally, there is a strong possibility that basement hosted mineralization is present in the immediate area. The features that define all three of these target types are described in more detail below, and each target area is shown on the cross-section in Figure 2.